As a cyber security expert serving thousands of organizations, John’s experiences have led to speaking engagements with the Pentagon, Visa, Charles Schwab, Homeland Security, the FDIC, Pfizer, Million Dollar Round Table, the FTC, Northrop Grumman, The Hartford, the Federal Reserve Bank, the University of Massachusetts and hundreds of organizations, universities, and associations of all types. No matter the size of the company or technical experience of the audience, John makes sure participants are motivated and educated to change their relationship to data security. John speaks from experience – his identity was stolen and used to electronically embezzle $300,000 from his business clients. While the cybercriminal masked their crimes using John’s identity, Sileo and his business were held legally and financially responsible for the felonies committed. The breach destroyed John’s company and consumed two years of his life as he fought to stay out of jail. Refusing to give in, John ultimately turned his experiences into his greatest success as a renowned cyber security expert. From real-life experiences with cybercrime came the first of several books, a great love of sharing what he’s learned, and a profound mission to help others defend data and tap into the resilience that defines who they are. Weaving his remarkable story with cutting-edge research, disarming humor and constant interaction, John inspires audiences worldwide to take ownership of the data that drives their success. In the words of one of John’s banking customers, “John took a sour batch lemons, squeezed out life lessons, sweetened them with laughter, and shared the lemonade with all of us!” Now he is one of the most recognized and respected thought leaders on cyber security, identity theft and entrepreneurial resilience. John focuses on ways to make security fun and engaging, so that it sticks. In one of the greatest honors of his professional life, John was joined the ranks of former U.S. President Ronald Reagan and General Colin Powell in the CPAE National Speaker Hall of Fame®. 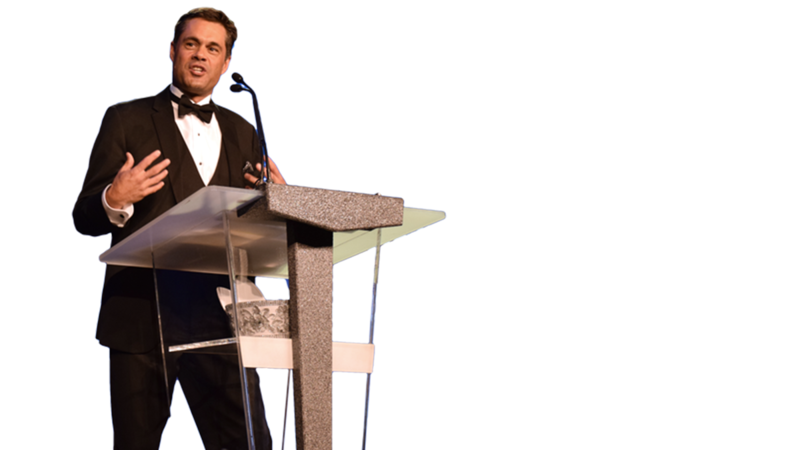 This award honors professional speakers who have reached the top echelon of platform excellence. Joining John on stage were fellow inductees David Glickman, Jason Hewlett, Jane Jenkins Herlong and Linda Larsen. In one of the greatest honors of his professional life, John was joined the ranks of former U.S. President Ronald Reagan and General Colin Powell in the CPAE National Speaker Hall of Fame®. This award honors professional speakers who have reached the top echelon of platform excellence. John is the first cyber security expert to be included in the Speakers Hall of Fame. Within one week of John’s training, a $300,000 fraud attempt was immediately detected and diffused by a member of our staff—a direct result of John’s training. John’s keynote presentation Think Like a Spy: Identity Theft Prevention was particularly well-received and a key reason why the vast majority of attendees expressed that this year’s conference was the best and most informative to date. Ready for an Unforgettable Story to Educate & Invigorate Your Audience? Sue is John‘s hyper-organized, super-sweet alter ego. As his business manager, Sue takes care of Sileo’s speaking clients like they are one of her precious puppies (which are pitbulls, so she can be firm when necessary). If Sue ever retires, John is going with her. When you talk to her on the phone (because she loves communicating in person), ask her to please, please not retire before she helps coordinate your event. You won‘t be sorry. You should also invite her to play golf with you at your favorite golf course, but don’t offer her olives, sushi or saurkraut afterwards, because she will fire you. You can reach Sue directly on 303.777.3221 x 101 or by filling out our Get in Touch form. Please call her Barb, and don‘t be intimidated by her title (CFO) because she also happens to be John’s Mom. This is significant, because how many families do you know that can work together for decades and still enjoy each other every day? Mostly that‘s because Barb is the friendliest person that you will ever meet (unless she’s forced to collect funds from you). When you get her on the phone, ask her about Scotland, her long winding conversion to scotch (those two are related), the finer aspects of Earl Grey tea, her love of watercolor painting and how she gently handles cranky John when he forgets to have lunch. Barb never really gets upset, so call her first if you are in an angry mood. She lives a life of balance, optimism and deep appreciation for things exactly as they are. Your day just wouldn‘t be complete without meeting Jim (Barb’s husband and coincidentally John‘s Dad). Jim started the first of the Sileo companies back in 1964 out of his garage (after deciding building rockets at Lockheed-Martin wasn’t his gig), long before John came along and destroyed the company so that he would have a moving signature story to share with your audience. Clients lucky enough to speak with Jim generally end up chatting more about travels to Italy, old-vine zinfandels and where in the world you come from than they do about business. Many clients book John purely because they love Jim and Barb. Seriously. Don‘t forget to ask Jim about the early 1900’s landmark building he‘s currently renovating (which is where we office - see pictures below), how dry he likes his macchiato or what has allowed he and Barb to be married more than half a century. Even if you don’t book John, it will be worth your time. Everything John does revolves around his family. In addition to working every day with his Mom and Dad (it was their business he destroyed, so it was the least he could do to employ them), John limits his travel so he can spend more time watching The Bachelor with his highly-spirited daughters (which he will deny, if asked), snowshoeing the Rocky Mountains with his adventurous wife and training for his 3rd-degree black belt in taekwondo (where he’s regularly thrashed by teenagers half his weight). John does in fact like pina coladas and getting caught in the rain. He likes raking leaves at midnight and is into champagne. Even though he graduated with honors from Harvard University (I know, we can‘t believe it either! ), he agreed to name his cairn terrier "Oreo" because that’s what his girls wanted. Actually, they wanted to name the dog Candy Machine, so Oreo was a pleasant compromise. John is more interested in making friends than in making money, but he still has to make a living speaking, which he dearly loves. Driven by cyber security expert and CEO John Sileo’s experience as a victim of identity theft and cyber crime, The Sileo Group is a security training think tank dedicated to helping organizations secure the data that drives their profits. The Sileo Group specializes in the human element of cyber security, identity theft, online privacy, social media defense and anti-fraud training and offers keynote speaking, executive coaching, and business strategy to help you quickly detect and deter all forms of cyber crime, including ransomware, cyber blackmail, denial of service attacks, IoT hacking, social engineering, pretexting, brute-force attacks, mobile hijacking, cloud cracking and insider theft. Barb and Jim Sileo on their wedding day. The Goodheart Laundry building in Denver, Colorado before it became the offices of Sileo. Jim Sileo starts the family business out of his garage. Sileo begins by repairing tube stereo tuners. Barb and Jim open three different locations and expand into TV repair. Sileo moves to it’s current location in the Goodheart Laundry Building in Denver. John and his sister pose in front of the building. Sileo expands into microcomputer business and eventually becomes one of the first PC dealers in the country. Ready for a Cyber Security Expert Who Will Captivate Your Audience Into Caring? Let cyber security expert John Sileo share his gripping story to motivate your audience into action.